Welcome to Mulder’s Landscape Supplies! At Mulder’s Landscape Supplies, we value all customers from beginning gardeners to seasoned landscapers. Locally owned since 1984, Mulder’s continues to be a leading landscape supplier in Southwest Michigan. We offer quality goods and reliable services to fit any need you have and help create the perfect landscape you have in mind. Landscape professionals trust Mulder’s to supply their needs from rakes and shovels to grass seed and blocks to processed manure to ensure that their facilities are well groomed and beautifully adorned. We enjoy helping homeowners and hobbyists do the same, too! 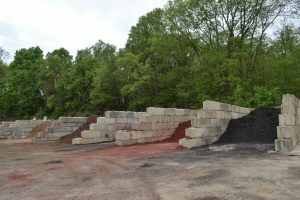 For professional or personal uses, Mulder’s customers always get a quality product at a fair price and we can deliver up to 35 cubic yards of certain materials. 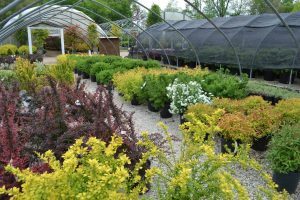 The fully stocked nursery at Mulder’s Nursery carries a wide variety of products including trees, hedges and shrubs, and perennials. From backyard beautification to commercial landscaping projects, our next door neighbors have got you covered! True to our name, Mulder’s Landscape Supplies carries a wide variety of supplies to meet the needs of professional and residential customers alike. From bulk products to processed manure to tools, we offer reasonable prices and dependable delivery options to get the job done. 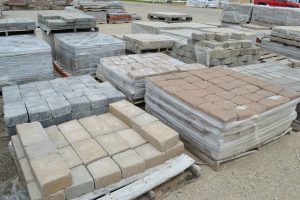 Mulder’s Landscape Supplies carries a wide variety of bricks and blocks – from pavers to retaining wall supplies – to help you find the right material for your project. Our knowledgeable staff is also available to help you create a one-of-a-kind design!